Got what’s likely to be the final quote in from Screens for the next shirt order. It’s been a long time coming, going through various options and revisions. A £500 order will get all the shirts up to stock (previously tried to keep a stock of 4 of each), increase the held stock on some to 5, and widen the range to include some ladies-fit shirts. The ladies fit will be standard black, light-pink and a blue one with the “union” variant on. There didn’t seem to be much interest in other colour options. The blue will probably sell for £13.50-£14 unless a cheaper shirt option comes up. The other ladies shirts will probably be about £12. The non-unisex base shirts cost more. Onward and upward though! The range widens! And I had a dream about the proposed Ferret shirt last night which had the colours perfect on it! So thank-you subconscious! So back to casting again, now the mini degasser’s working (and working well at that!). Success in casting the hemispheres in water-clear styrene! Last night I carefully trimmed the silicone moulds back to make the walls very thin, so they were drawn in with the surface tension as the styrene shrinks. This meant no streaks anymore, and there doesn’t seem to be any noticeable distortion of the shape. The biggest problem us then actually getting the styrene out of the tin, especially in small amounts. It’s provided in a paint-tin, so unless you’re using the whole lot in one, you need a way to extract small amounts, and a plastic mixing cup is too big to fit in. So today I quickly brazed together mini ladle out of the stainless lid from a cocktail shaker and a long bolt with a couple of nuts for grip. I’m keeping it in a glass jar, since I only have one sort of styrene to use, and apparently it’s not hygroscopic like the PU resins are. So this’ll keep it from needing repeated cleaning. Tonight I finally got a really rich chocolate colour for the only remaining casting order from before Confuzzled. “What would a melted KitKat look like?” was a good visual guide. The resin claws and footpads are setting overnight. As tomorrow is MCM Expo and I don’t know what time I’ll get home, casting will probably resume on sunday. I’ve been making enquiries into new variations on the standard UKFur design shirts. I’ll be getting a few “4XL” in in the unisex. Technically they’re still 3XL, but of a shirt type where it corresponds to a 54/56″ chest rather than a 50/52″. Also been gaining interest in getting some shirts in fitted ladies sizes. Currently looking at getting some in standard black.. but also pink. And other colours too, of course! Oddly enough, this one is a heavier weight of cotton than the one I was previously looking at, but much more affordable, and should put the ladies shirts at £12 in whatever colour. As the next LondonFurs meet is only a week away, I’ll likely make the next order after that (as I may need the extra cash I’ll hopefully earn there, to make this increasingly large order). Train tickets to Confuzzled in one months time have been booked. I’ll be leaving at about 11am on the Monday, but the rest of the fares for the day are double that ones price. The short-order shirts have arrived. A low-profit run due to small order fees, but was hoping it’d be enough to get the ball rolling again. UKFur original design, black and white. Two in each size, Small, Medium and Large, so £10 each. The red and white design on blue, got that in in Large, 4 items. £12 each. £2.50 postage if you’re interested. These should all be guaranteed sales, as people requested them specifically. I’ve sent notes to all of them. Sadly I’m already getting replies back saying they’ll buy them at the next meet, not via paypal. I’m hoping this doesn’t mean I’ll make no sales on them for two weeks, because my kitty’s already gone on the train tickets. I need a float again much sooner than that. I have orders to post, and ideally need to make another shirts order before Confuzzled with at least two weeks notice. The next meet will be only 8 working days from Confuzzled, and will include the payment deadline for this years RBW. In short, despite hopes, looks like I’m still haemorrhaging money. Once again, things have been busy here! I’m currently processing orders, albeit with a small delay (manifold broke off the degassing chamber and I’m waiting for the glue to set). There have been two major developments however. 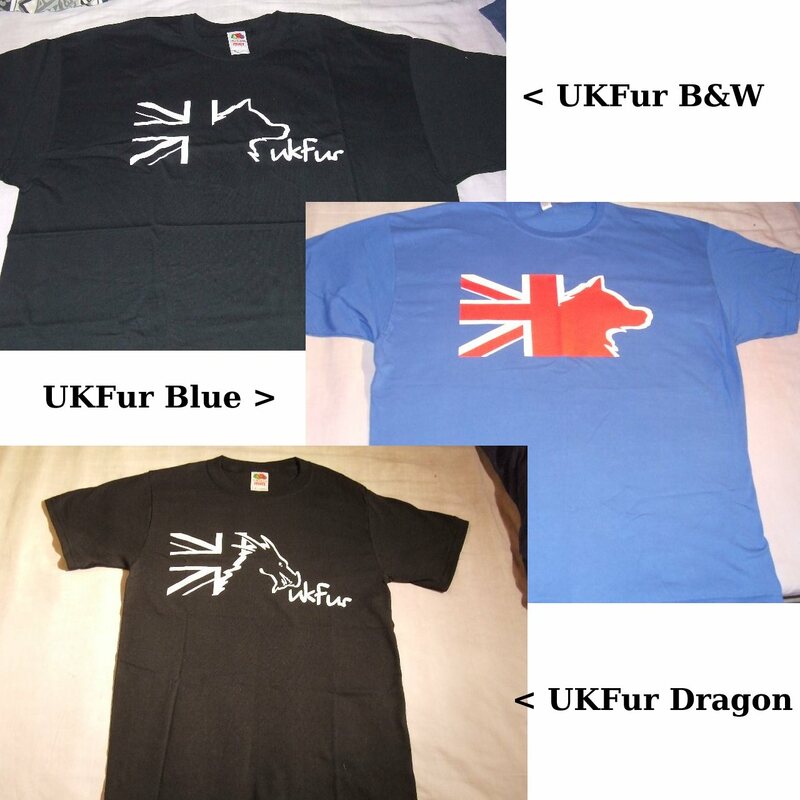 I’ve now purchased the UKFur merchandise shop from previous owner Tigerfire, who’s no longer as involved in the Furry scene as he once was. In the next couple of days I should receive the first batch of new stock, to get a small number of the most in-demand shirts and sizes. It’s out of stock of the lanyards, but I’m looking around for a supplier that will provide them in minimum orders of less than £200. However still have large numbers of vinyl stickers and silicone wristbands. Confuzzled is just a month away now, so have no fear, you will be able to get your UKFur merch! In the meantime though, wristbands are £1.50, stickers are 50p each. B&W shirts are £10 in Small to XL sizes, and £11 in XXL and XXXL. Blue shirts are £12 in Small to XL sizes, and £13 in XXL and XXXL. £2 for postage, and I still take paypal. If I’m out of stock, let me know the size you’re after so I can get more in and I’ll let you know when I do. 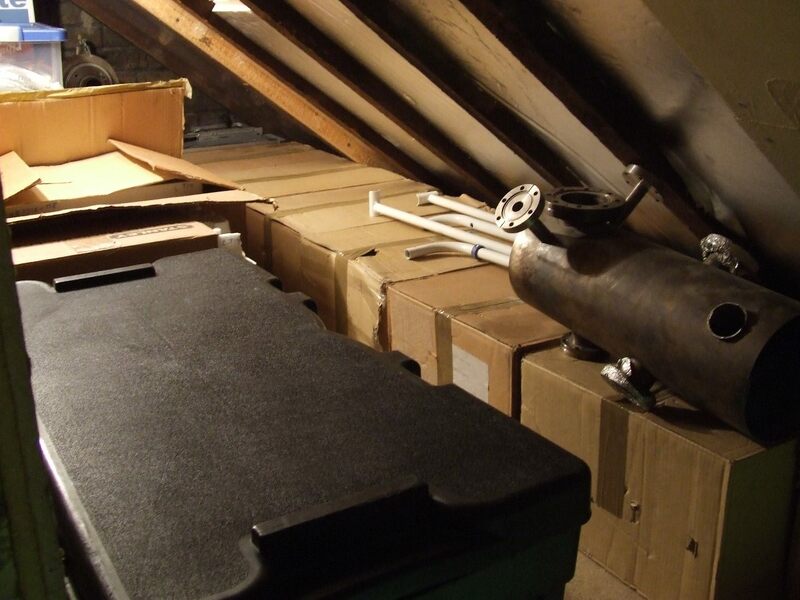 Shortly after buying the UKFur shop I also acquired a lot of 2000 surplus stepper motors. I strongly believe the future is in 3D printers, but there’s a big supply issue. Even the home-made machines tend to require you to already have a 3D printer to make parts for it. The way around this is to make a bootstrapping machine to make the initial parts. A rep-strap. The motors I have are smaller than those advised in the Reprap project, but I have my own take on it. I’m developing a small, semi-portable 3D printer, that should be fairly cheap and easy to modify. I’m looking at a sale price in the £200 range, and a quantity of around 500 machines. Because of the small size of these printers, I’m dubbing it the Bonsai Repstrap. It’s an ambitious project I know! But if you want to follow how things are going with it, take a look at..
I’ve set up a journal over at Dreamwidth as a stand-alone creative blog. While this won’t be strictly business related, it will include and business creations and day-to-day activities as well as my personal works. Dreamwidth incorporates RSS feeds into the blogs, so you don’t have to sign up to follow it. It also accepts OpenID logins, so you can comment if you like. Contacted shirt supplier. Should be able make an initial small-order with a penalty fee, but it’ll get in the stuff there’s demand for. Also enquired over getting patches made. Ballpark prices fairly reasonable. But don’t think I could get much of a markup on them. Still.. Received in the post today; 24 DIL sockets. Should allow quick replacement of the 4N35 photo-isolators on the parallel port breakout board I’ll be making for the Bonsai reprap. I really don’t want to kill the workshop PC, after-all. Nor do I want to have to re-solder the board when something inevitably goes sparkly-wrong. Currently doing inventory on mobile shop stock. Almost there.